I'm finally back from NARCON, and what a weekend it was! 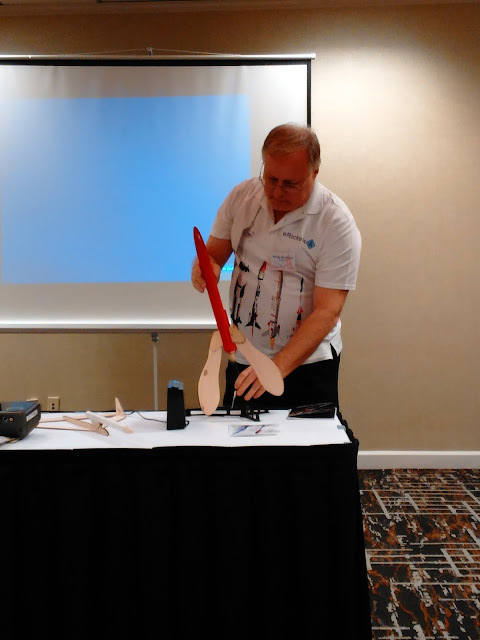 Three days of presentations on all aspects of rocketry, plus museum tours, dinner, and a speech by one of model rocketry's beloved company founders, all took place at the Crown Plaza Dulles Airport hotel in Herndon, Virginia, just outside Washington, D.C. The hotel was conveniently located a short shuttle ride from the airport, and not far from the National Air and Space Museum's Udvar-Hazy Center. Plus, there was a real NASA sounding rocket - the Canadian-built Black Brant V, seen above - on display in the parking lot outside all weekend. This in fact caused a bit of a stir, when an F.B.I. agent driving by noticed the hulking rocket sitting in a hotel parking lot, got a little suspicious about this, and called the police. NAR officials quickly cleared this up, and the police apparently had a bit of a laugh about the whole thing. 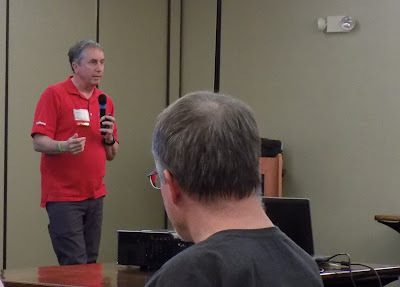 This year's convention was hosted by NOVAAR - the Northern Virginia Association of Rocketry - and they put together a great event. Orange and black are the official colors of NOVAAR. The event director was Trip Barber, a longtime rocketeer who did some important early research in model rocket staging, and the founder of TARC - the Team America Rocketry Challenge contest for student teams. I arrived at the hotel around 11:30 in the morning on Friday, and met CG, co-host and creator of The Rocketry Show podcast, for the first time. Despite the fact that we're on the same show, we'd never met in person before. 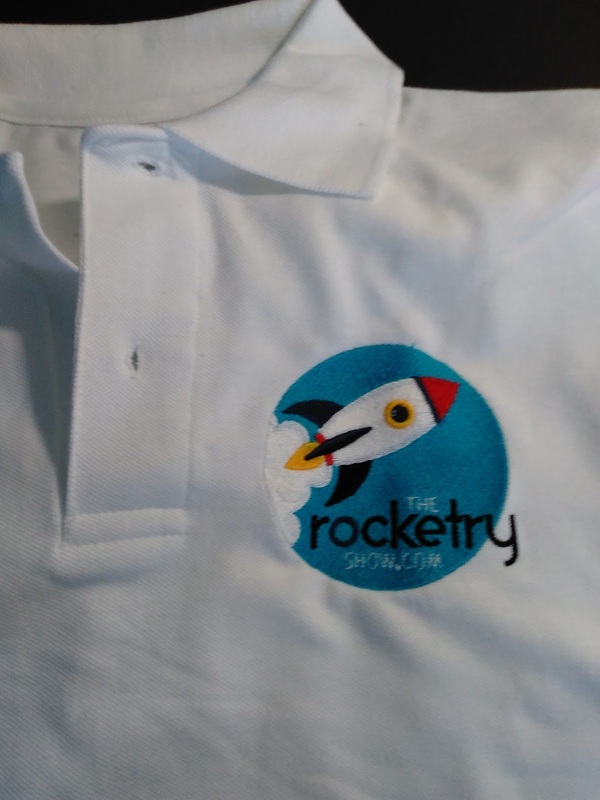 He gave me my official Rocketry Show shirt to wear at the weekend's events. It's pretty nice! We went to the Udvar-Hazy Center to look around and record some video and audio for the podcast, including the teaser video I posted yesterday. Friday night began with a town hall meeting where NAR president John Hochheimer discussed the state of the NAR and the board's pre-NARCON decisions about the organization. Membership continues to reach record highs, and the organization is in good financial shape. This was followed by Research and Development presentations. This is a competition event for those wishing to present projects on technical development in the hobby, and presenters were vying for $1,000 in cash prizes. International competitor Stoil Avramov showed techniques he uses for building incredibly light, perfectly airfoiled wings for competition rocket gliders. Building up wings from multiple materials - a foam core and various materials for skins and hinges, he has perfected wing building. My camera had a hard time with some of the lighting this weekend, so some of these photos are a little blurry. 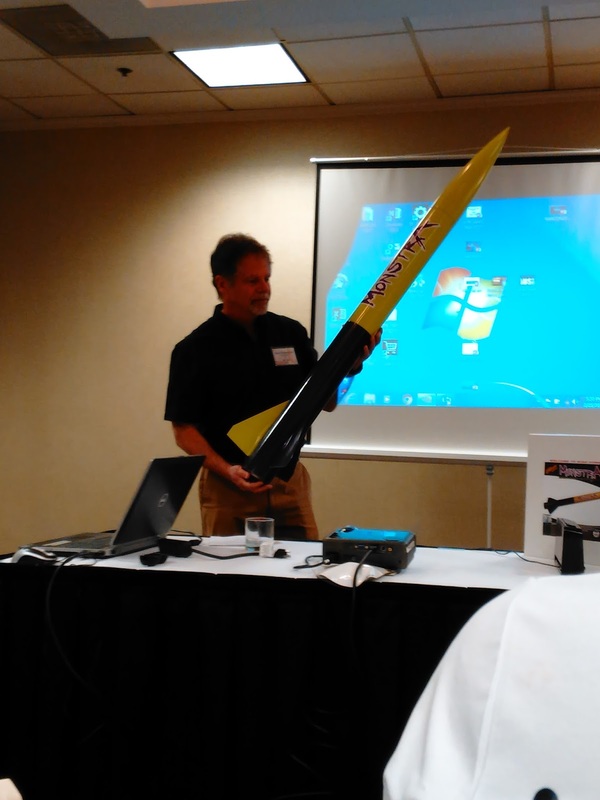 Stoil Avramov shows off one of his competition rocket gliders. 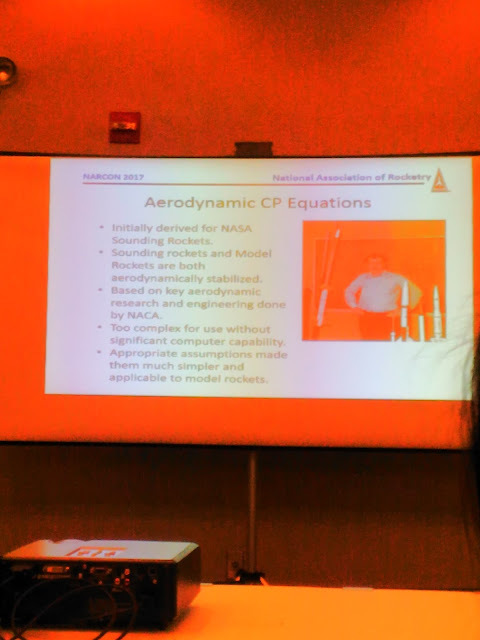 Matt Steele, of North Coast Rocketry, presented an analysis of S1 performance in the 2016 World Championships for Spacemodeling. The S1 competition is a two-stage altitude competition, where juniors fly 1/2A to 1/2A staged motors, while seniors fly A to A stages. These are very lightweight rockets. Matt made a couple of interesting points. For best altitude, it is best to have the booster (first stage) as light as possible. If it were possible to have a massless booster, that would be best. But a sustainer (upper stage) performs best between about 9 and 11 grams. That is the optimal mass. Another interesting result of the analysis has to do with the timing of the staging. Multistage model rockets typically use direct staging, in which the lower, booster stage rocket motor ignites the upper stage motor, when the propellant burns its way through the top of the motor. There is no delay grain or ejection charge - just a propellant grain which is exposed at the top of the motor. As such, there is only about 0.001 second between burnout of the lower motor and ignition of the upper motor (this 0.001-second delay was actually described by Trip Barber during his college days - the work I mentioned above - and is thus known as the "Barber delay"). In other words, staging is nearly instantaneous. By doing this, the upper stage model is "launched" in midair, but already traveling upward very fast. Therefore, the velocity of the boosted rocket is added to the sustainer or main stage, giving the model a much higher performance than if it were launched standing still. 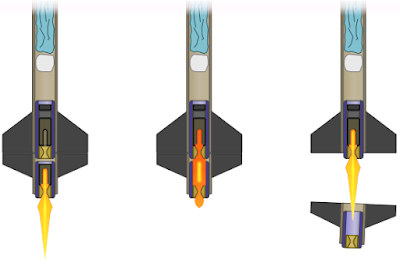 High power rockets and those that use composite propellants, however, often have a delay between the lower stage burnout and upper stage ignition. The booster will burn out, the stages will separate due to the drag on the lower stage, and the upper stage is then ignited by an electronic system carried on the rocket itself. What Steele said is that, according to his analysis, there would actually be an altitude advantage on an FAI competition model if there were such a delay between booster burnout and sustainer ignition. This surprising is in contrast to what most people assume, because of the way staging is described in The Handbook of Model Rocketry. The reason is that most people forget that when describing the altitude gains in direct staging, G. Harry Stine was assuming that there was no aerodynamic drag. By increasing velocity of the rocket, you increase drag dramatically. Therefore, there is an advantage gained by allowing the rocket to coast a bit between booster burnout and sustainer ignition - provided the rocket doesn't begin to arc into the wind, of course! In reality, delayed staging like that is impractical in a contest rocket, because there is a weight penalty. The electronics needed to ignite the upper stage would add mass to the rocket. Tim Van Milligan of Apogee Components presented a computer analysis of drag on launch lugs, launch rail buttons, and launch rail guides. I was really interested in this one. 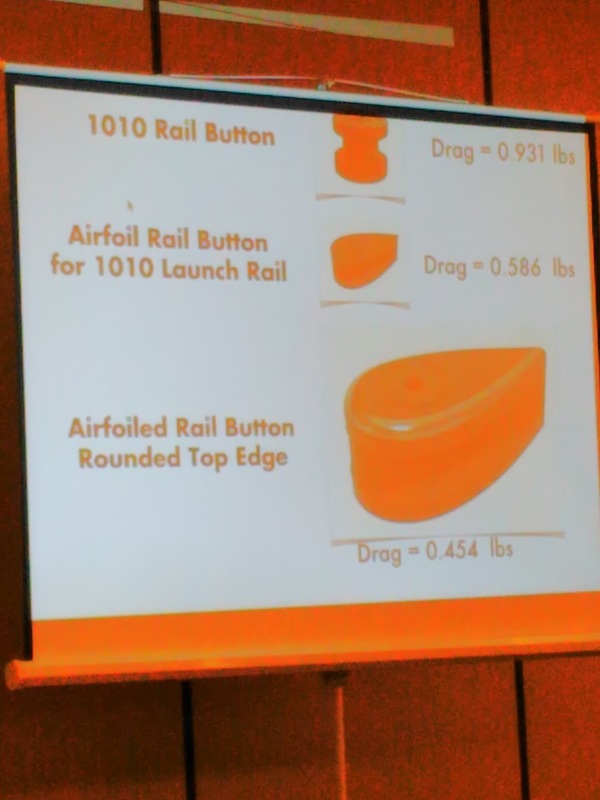 I have seen in online forums that a lot of people assume that rail buttons create less drag than launch lugs. A lot is made of the drag of launch lugs, including in The Handbook of Model Rocketry. But to my knowledge, the drag of lugs and rail buttons had never been put to the test, and it seemed that everyone was assuming that buttons are of lower drag. I won't go into too much detail here, because this subject will almost certainly be the topic of an upcoming Apogee Components newsletter. But I'll just say that, according to the airflow computer simulation software he used, Van Milligan found that launch lugs have the lowest drag, while rail buttons have the highest. Launch rail guides are in the middle. Some other interesting findings - airfoiled rail buttons (such as the one seen above) actually do have lower drag than standard buttons, and the drag can theoretically be lowered further by rounding the sharp edges on the tops of them, and launch lug drag can be lowered further by shaping as well. 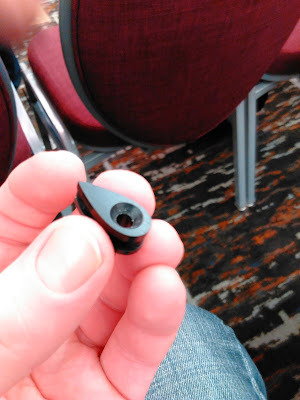 Also surprising, long launch lugs appear to create less drag than short lugs. extra large simulated model to get more clear information. It is important to note that this is just a computer analysis using an airflow simulator. To get the real story, wind tunnel testing would need to be conducted, and flight testing would confirm whether the effects seen in this study would be significant enough to affect model rocket flight in a noticeable way. 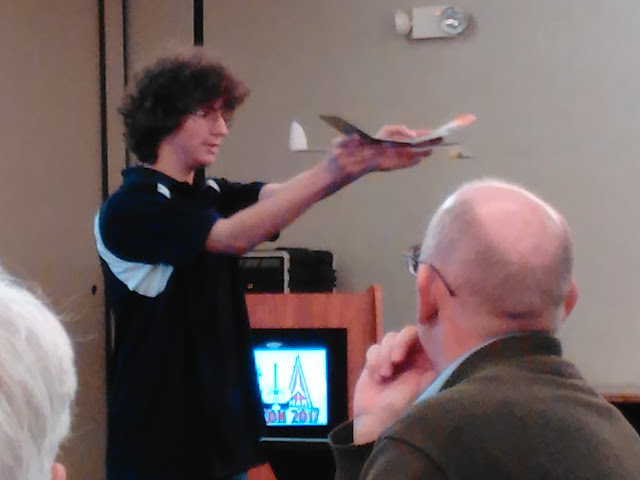 Dan Wolf presented his project, creating a digital pressure sensor emulator, which he hopes to use in altimeter testing. This is to verify the accuracy - and consistency - of various commercially-available altimeters. 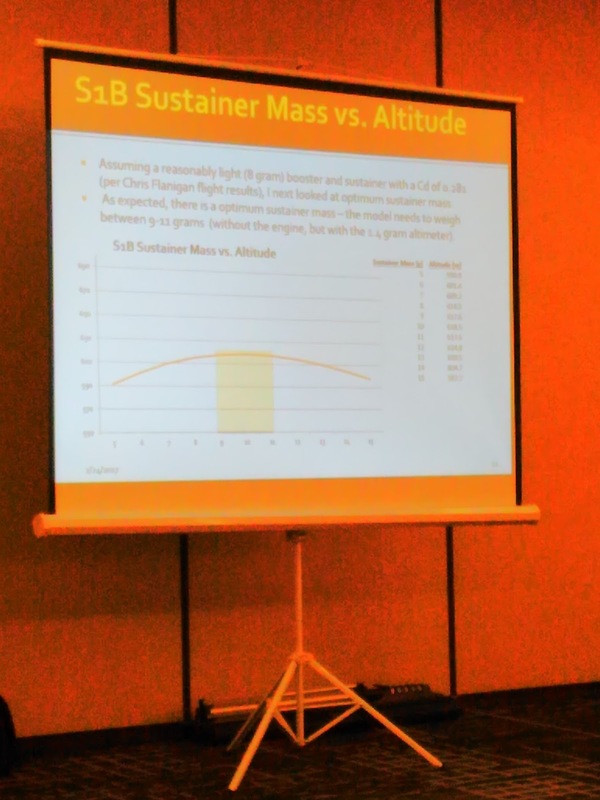 And Chris Flanigan, another contest flyer, presented comparisons of predicted and flight data for rockets flying from an 18mm piston launcher (a piston launcher is used in contest rocketry instead of a traditional launch pad and rod. It uses the motor's gasses to impart more velocity to the rocket at liftoff in an attempt to reach higher altitudes). First prize went to Chris Flanigan, second to Stoil Avramov, third to Matt Steele, and honorable mention to both Tim Van Milligan and Dan Wolf. On Saturday, the breakout sessions took place. There were four "tracks" you could choose from: TARC Rocketry, Professional Rocketry & Spaceflight, Model Rocketry, and High Power Rocketry. Honestly, it was sometimes hard to choose what to see. There were seven scheduled hour-long sessions with one session in each track, so you could see up to seven presentations. I made it to five in total. I wish I had seen others, but CG and I needed to record some stuff for the podcast. We chatted with the vendors in the Vendors Display Room. Those conversations will be on the forthcoming podcast. 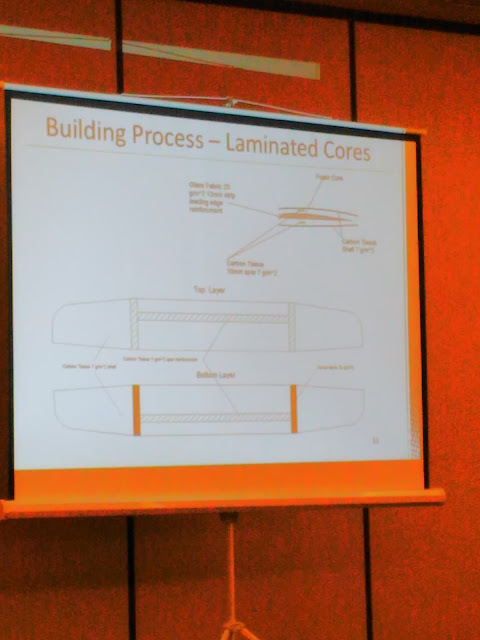 I saw presentations on NASA's sounding rocket operations, Tim Van Milligan's demo of doing a lightweight fiberglass layup for FAI contest rockets, and a presentation on painting and finishing which was really aimed at TARC rocketeers (this year's contest rules include the requirement that all rockets must be colored somehow or another - be it paint, marker, colored tape, Monokote covering, etc). 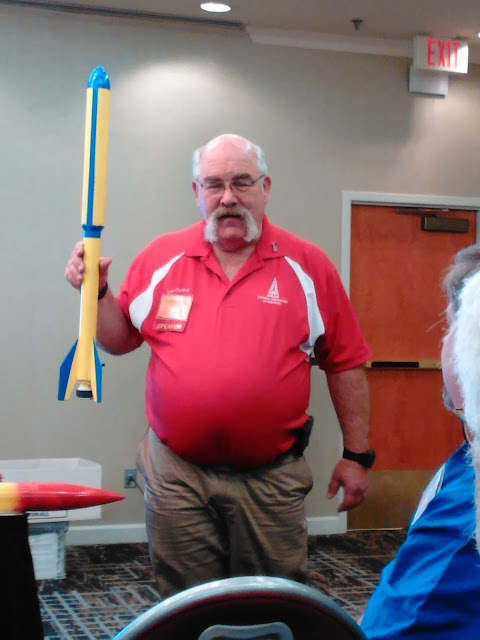 Carl Curling describes how this TARC rocket was finished and painted. Later in the afternoon, I went to hear Jim Barrowman speak in a TARC Rocketry session. Barrowman created simplified mathematical equations for finding the center of pressure on a model rocket, which enabled rocketeers to create designs and know they would be stable in flight. His work is used in all rocket simulation software today, such as RockSim and OpenRocket. He based these equations - what became known as "the Barrowman equations" - on his work with sounding rockets. The room was packed. He said at the outset that the session would cover the basics in Centuri TIR-30, and would not be about the Barrowman equations, and that he would understand if anybody felt bored or left. Of course, nobody did! After the session, Jim came to the Vendor's Room where CG and I had set up a table to record, and he was gracious enough to grant us an interview. I turned to him as we were setting up and said "I have to admit that I'm pretty nervous." But he was so easy to talk to. Jim Barrowman is a really approachable person, and we ended up having a great conversation. Once we ended the interview, we continued chatting, and had a conversation that I can only describe as delightful. CG said "I should have been recording this!" Me, Jim Barrowman, and CG. Meeting this man was worth the whole trip. But the interview was terrific, and I really think you'll enjoy it. Some of the most exciting news came from the Manufacturer's Forum at 5p.m. There were nine vendors there to discuss new products, and each had a limit of five minutes to present. Here are the ones I think readers of this blog will find most interesting. Jolly Logic has a number of exciting things in the works. First, the next iteration of the Chute Release will include more ergonomic, easier-to-use buttons. New bands and chute deployment bags for larger chutes for high power are being developed. Second, a smaller version of the Chute Release is in the works! This was hinted at on Twitter a while back, and John Beans is currently working on it. He has to build a whole new servo in order to do it. 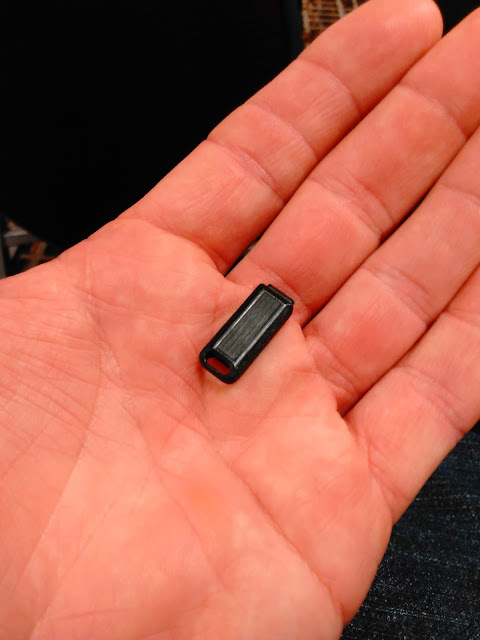 The current Chute Release uses the smallest servo he can find. But the good news is that the new Chute Release should fit into a much smaller tube, and due to being smaller, should be less expensive than the current Chute Release. Both of these are great selling points, especially for model rocketeers with a fleetfull of smaller sized rockets. The new Chute Release will probably not be out this year, but likely in 2018. What should be released sooner, however, is the Altimeter Four. Before Chute Release, Jolly Logic was primarily known as a maker of versatile, easy-to-use altimeters. 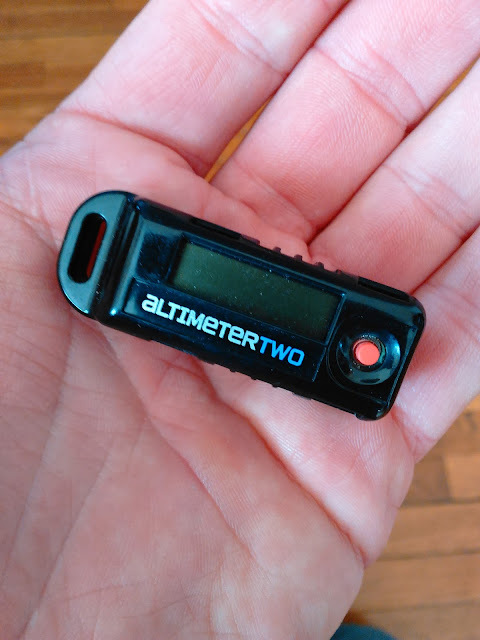 Here is a photo of my Altimeter Two, which weighs about 10 grams. It's a great altimeter which gives a lot of interesting flight information. But at 10 grams, it can be a little heavy for smaller low power birds. Well, here is a 3D printed "size model" of what Altimeter Four will look like. Altimeter Four's projected weight - one gram! Not only that, it will connect to a computer or phone and give all the flight analysis information you'd expect from a Jolly Logic altimeter, including a flight profile in graphic form like the Altimeter Three. [EDIT] I nearly forgot to mention that John is working on a GPS location solution for rockets. Knowing how easy Jolly Logic stuff is to use, I can't wait for this to come out! It may take some time, but I'll definitely put it in the shopping cart. AeroTech has a number of exciting things coming out - both new kits and new motors. The four-inch diameter Monstra will be able to fly Level 1 and Level 2 HPR flights with its 38mm diameter motor tube, and four-inch airframe. It features a recovery harness from One Bad Hawk. And the beautiful "fantasy scale" Arreauxbee-Hi is a cross between the AeroTech Arreaux and an Aerobee-Hi scale model. It flies on 29mm motors, and I wanted to take it home with me. The new kits include screw-on motor retainers instead of motor hooks, and also have both launch lugs and rail guides, so the rocketeer has the option of either one without having to purchase additional hardware separately. A new single-use F motor is debuting soon, the F67 Economax. Why an F? 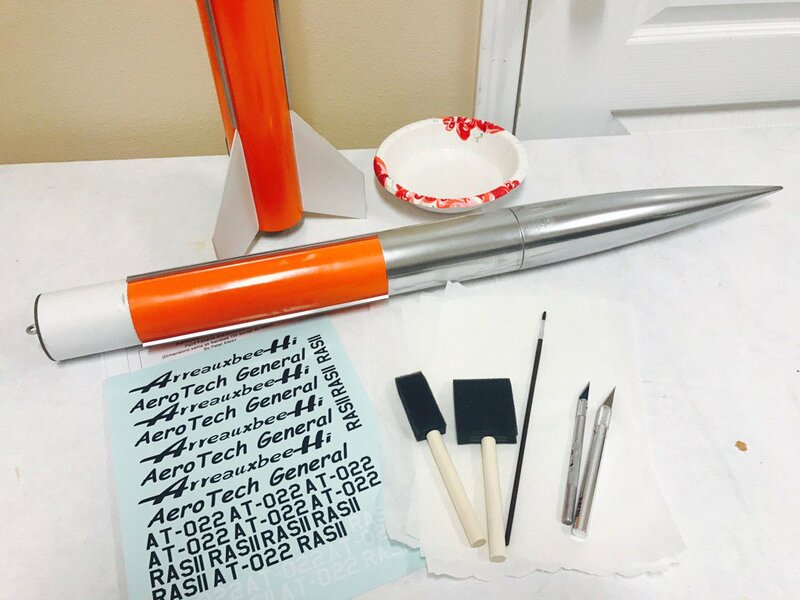 Gary Rosenfield, the owner of AeroTech, explained it was their attempt to get the most power they could from 30 grams of propellant. 30 grams is the most that can be legally shipped via the US Postal Service, rather than via UPS with a HAZMAT fee. The 14-second delay won't be featured. Delays will be 4, 6, and 9 seconds. Speaking of US Mail shippable motors, another exciting development by AeroTech for HPR fliers is a non-HAZMAT J motor! This is pretty unusual, and it's accomplished by dividing the motor into 13 individual 30 gram propellant grains. This, says owner Gary Rosenfield, will be about as far as they'll go with that, so don't expect a mailable M motor any time soon! As for the Quest Q-Jet composite model rocket motors, they only had on display the A3 motors, which have passed certification, but the others are still waiting to finish the process. They'll all be released at the same time, once all motors have been certified. According to Gary, this is one of the hardest motors AeroTech has made, but it will be exciting for us when they are finally available. Tim Van Milligan announce Apogee's intent to release ten new kits this year. Apogee is hiring a marketing person and a web developer. ASP showed off some of their new 29mm powered mid powered scale kits. These weren't new at NARCON, but it was nice to see them in person, particularly the Sandia Sandhawk, the D Region Tomahawk, and the WAC Corporal models. These are pretty simple kits that a relative beginner can assemble without much trouble, but with accurately-sized parts so that an experienced builder can add details and have a very faithful scale model. Due out mid to late summer are three more scale kits, details of which will be announced later. There are now 125 Semroc kits through eRockets, and the number continues to grow. The Blue Jay is a new delta-wing glider with an extra wide keel and a beefed-up front end. The Maple Seed is a sort of odd-rock with maple seed-shaped fins. At apogee, the seed-shaped fins detach and helicopter down, just like the real thing. Also coming out later this year, provided Estes doesn't change their mind and re-release it, will be a Semroc version of the Scissor Wing Transport, a boost glider which always had a bit of trouble flying just right. Randy Boadway of eRockets says he's solved the problems with the Scissor Wing, and it should be flyable more than once or twice. Chad had an Estes Scissor Wing Transport, and I can tell you that it was tough to get it to fly right. 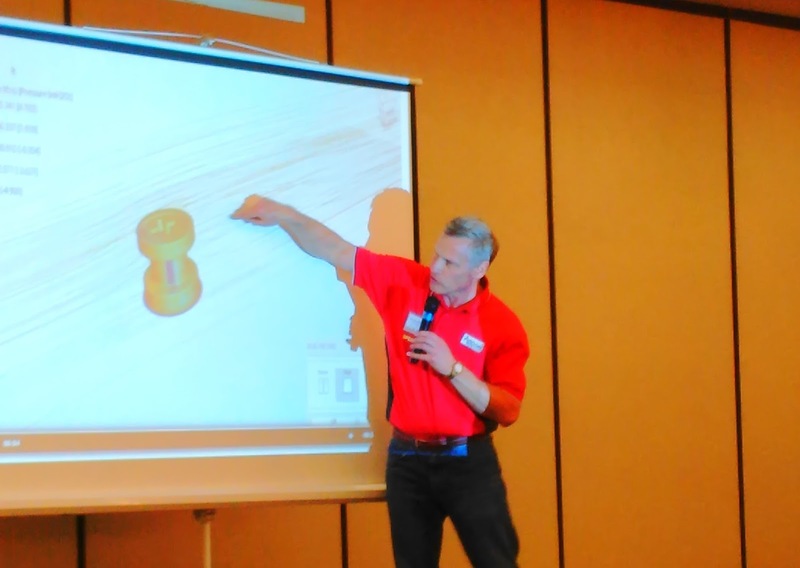 Matt Steele presented a new kit, an upscale of the Estes Goblin, called the Hobgoblin. It will fly on 29mm motors. It's actually a much smaller version of a North Coast Hobgoblin from years ago, which was 8 inches in diameter. This one is pretty fun and still nice and fat at 2.6 inches in diameter. 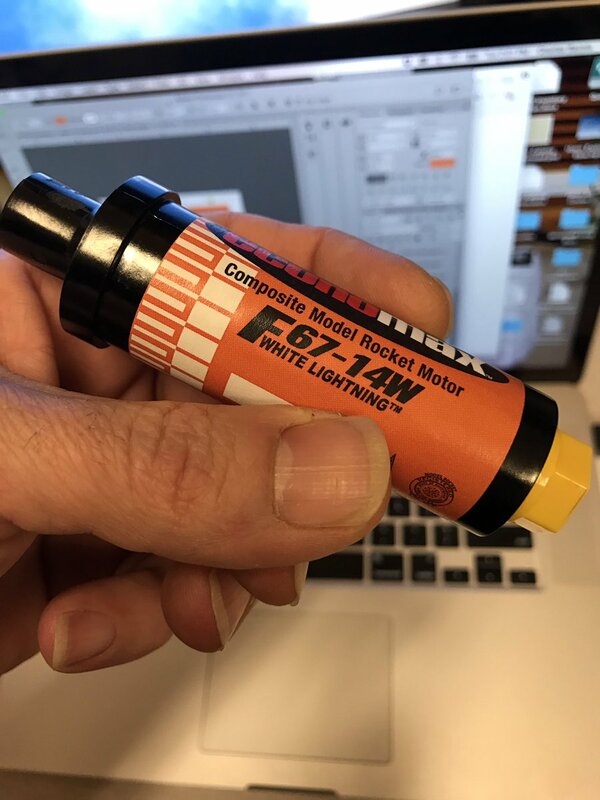 Also coming soon from NCR are 29mm screw-on motor retainers similar to those sold by Estes, but with rocket nozzle details attached, so your mid power model rocket can look more like a space launch vehicle. 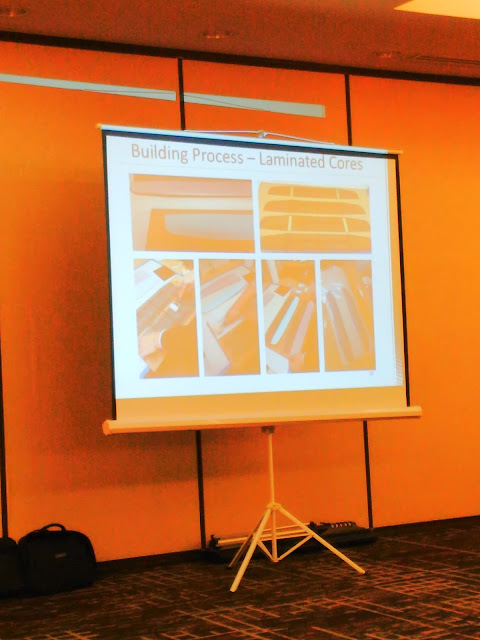 Wes Oleszewski of Dr. Zooch presented at the Manufacturer's Forum. While they won't have any new kits, Wes does have a series of books on the history of spaceflight, Growing Up with Space Flight (click here for an example). You'll hear more from Wes on the upcoming podcast. 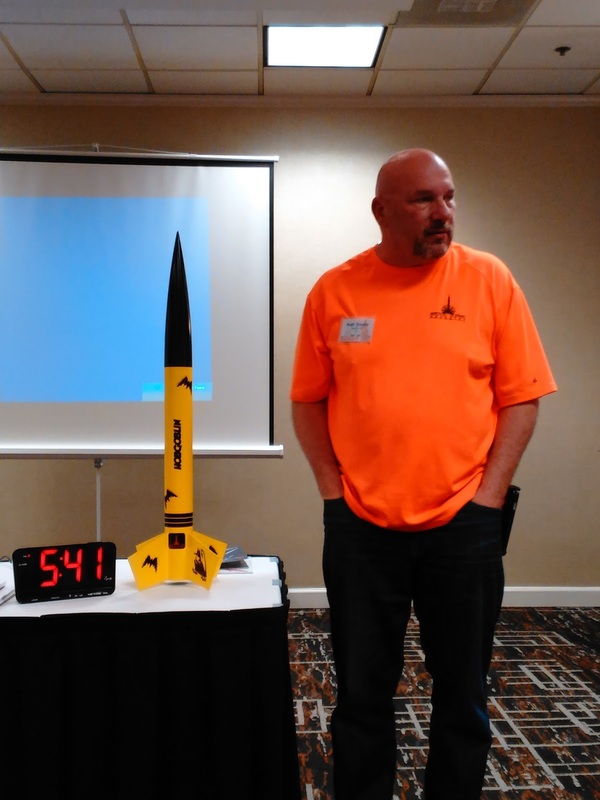 At the banquet, Lee Piester of Centuri Engineering, told the story of his time running a much-loved model rocket company. It was an inspiring story with some surprising details, and even made me nostalgic for Centuri rockets, even though I was far too young for rocketry when Centuri did most of its business, being nine years old when the Centuri line was finally discontinued. We hope to have Lee Piester on the podcast soon. Door prizes were handed out. 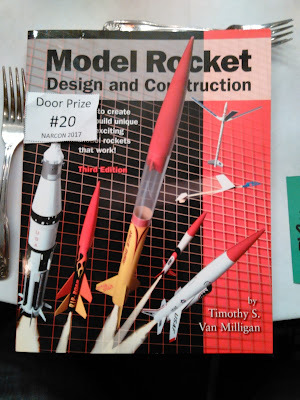 John Beans had donated ten Jolly Logic Chute Releases, and while I didn't win one to replace my lost one, as I'd been hoping, I did in fact get a pretty great prize for me - a copy of Tim Van Milligan's book Model Rocket Design and Construction, something to add to the library. After the proceedings on Saturday, I sat in the hotel restaurant with Bill Cooke of The Rocketeer's Corner blog and had a great chat. Bill's a really nice guy with a fun blog (check out his stuff about "Geezer TARC"), and we shared modeling tips - well, mostly I asked him how he builds such nice looking rockets. Sunday I returned to the museum with those who stuck around, and stayed there for five hours, looking at planes, models and space ships. It was a perfect weekend, and I managed to only spend slightly too much money. Thanks to NOVAAR and the NAR for such a fun conference! NARCON 2017 is over. There were a lot of exciting things announced, we got some good stuff for The Rocketry Show, and I had a great time. But it's late Sunday night, and I fly back to Boston tomorrow early in the morning. So look for a recap in the next day or two. In the meantime, enjoy this little video that CG and I recorded at the Udvar-Hazy Center of the National Air and Space Museum for The Rocketry Show podcast. The guy in the middle was a real pioneer - and is a great guy to talk to! Inside the Udvar-Hazy Center, image from the National Air and Space Museum website. NARCON 2017, the National Association of Rocketry's annual conference, is sold out. They increased the available reservations to double the previous record, meaning that this year's conference will be the most-attended in history. Despite the increased capacity, NARCON sold out a couple of weeks ago! This year's conference will be in Herndon, VA, near Washington, D.C., and will include a tour of the Udvar-Hazy Center of the Smithsonian Insitution's National Air and Space Museum. Included in the museum's collection is the Space Shuttle Discovery, seen in the amazing room full of stuff in the photo above. 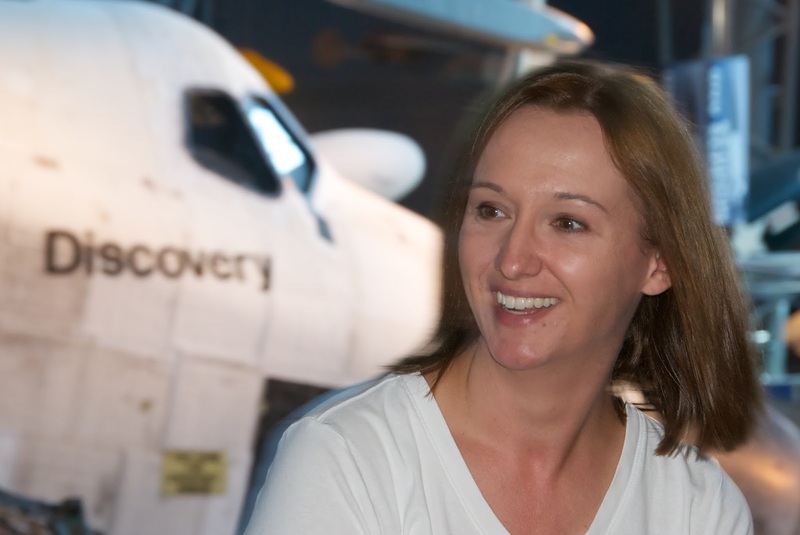 In advance of the conference, we talked to museum curator Dr. Jennifer Levasseur on The Rocketry Show podcast, who gave us a virtual tour of the Udvar-Hazy Center and told us a lot about how they do things at the Air and Space Museum. I am simply busting with excitement to go to this year's conference. It's going to be packed with fascinating presentations on model rocketry, high power rocketry, TARC, and professional rocketry and spaceflight. Jim Barrowman will be there! 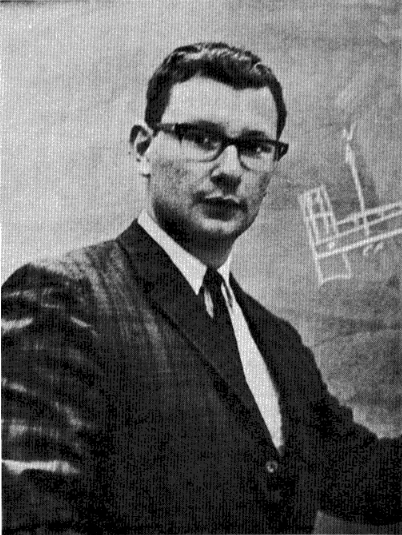 In 1966, Jim and Judith Barrowman presented a paper at NARAM 8, as part of the Research and Development competition, in which they demonstrated a mathematical method of determining the aerodynamic center of pressure on a rocket. This changed everything. 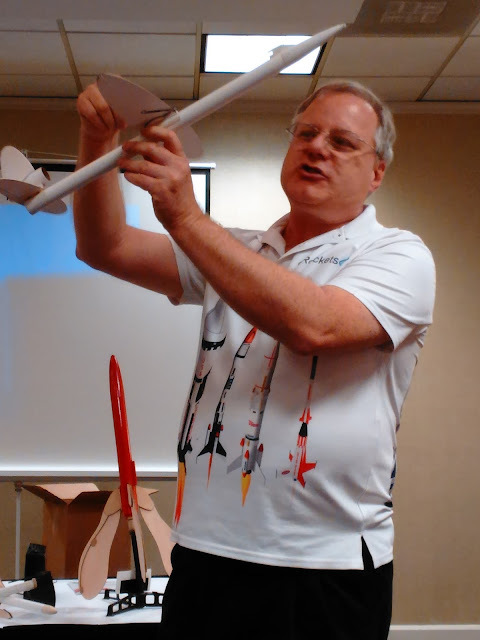 Model rocketeers were no longer left to guess whether their designs would be stable, or to use the less-than-ideal "paper cutout" method (more on this method when we return to my series on model rocket stability). Lee Piester of Centuri Engineering Company will give the keynote speech after the banquet. 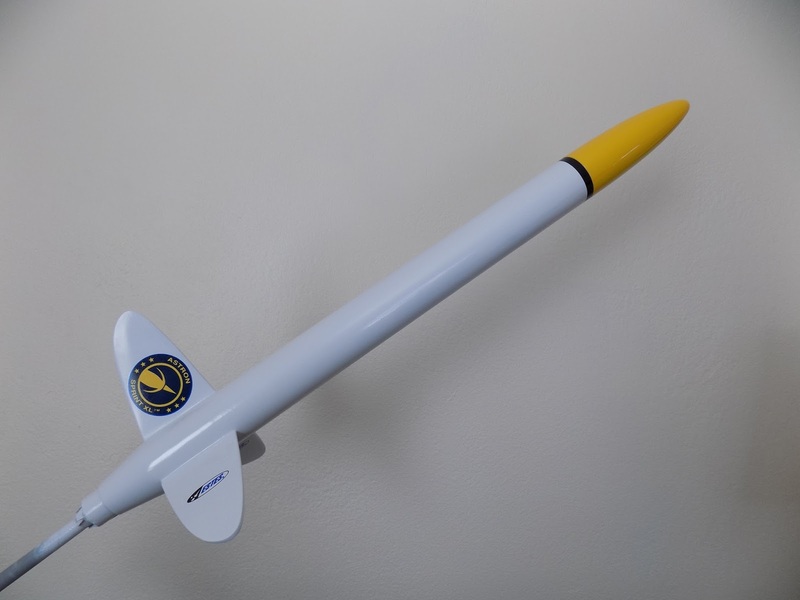 Centuri was a model rocket company you hear a lot about from long-time rocketeers. They eventually became part of Estes Industries, and sometimes you can still see their design influence today in certain Estes kits. 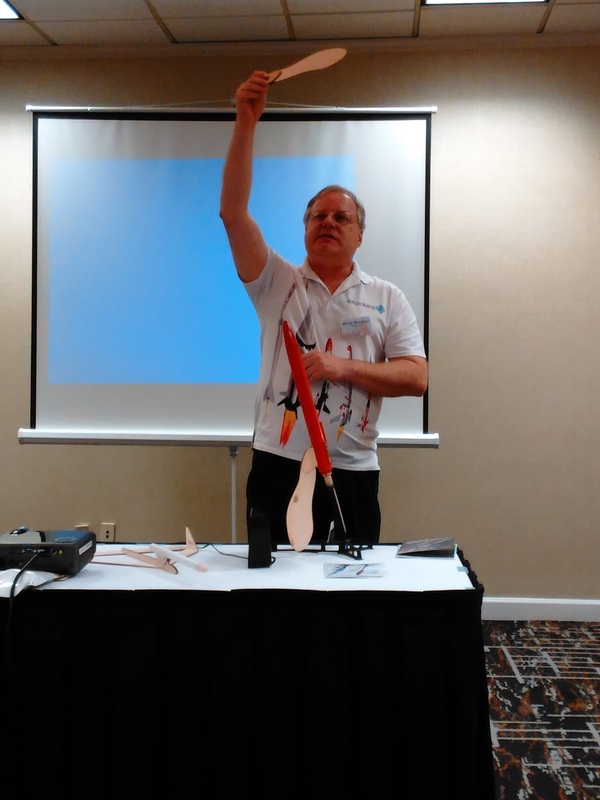 Trip Barber, who did some important work on model rocket staging back in his college days at MIT, and who was an early NAR president, will give presentations on TARC - Team America Rocketry Challenge, a program he was instrumental in building. Current NAR president John Hochheimer, as well as the most recent former president Ted Cochran, will both be in attendance. 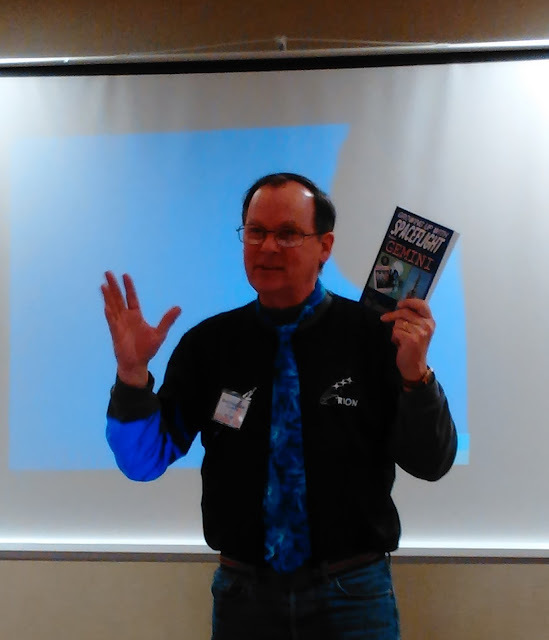 Tim Van Milligan of Apogee Components will be a presenter. Tom Ha and Adam Martin will discuss rocketry in Australia. A number of representatives from NASA will be on hand giving lectures on the sounding rocket program, the Orion program, satellite launching, the James Webb space telescope, and more, and a representative of the Federal Aviation Administration will discuss the process of obtaining FAA waivers for high power rocket launches. There will be so much information packed into just a couple of days! Also, plenty of vendors will be there. AeroTech, of course, will make an announcement - or perhaps several. Matt Steele of North Coast Rocketry, a mid power rocket company, said he'll have "some news," which sounds pretty exciting. 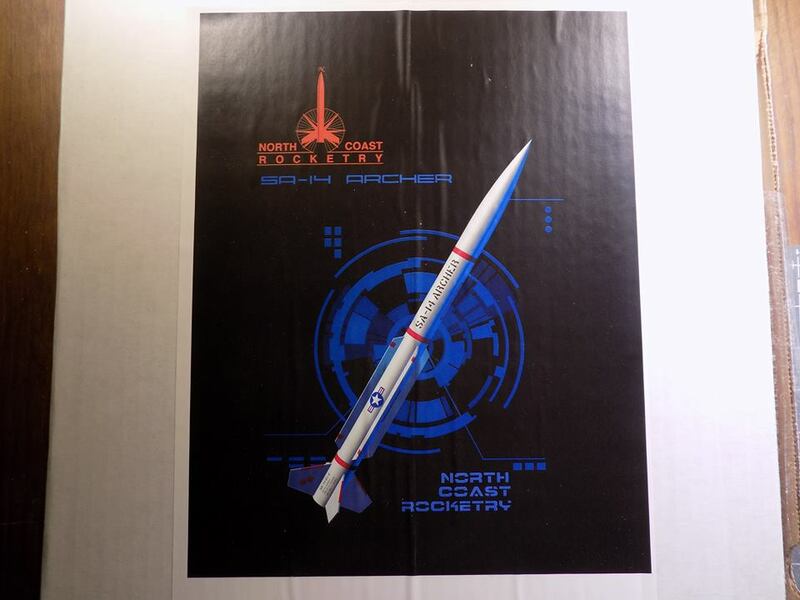 Show sponsor North Coast Rocketry's SA-14 Archer. They sent this as part of their sponsorship - it was on my wish list! I'm pretty sure John Beans of Jolly Logic will be on hand, as will Randy Boadway of eRockets and Semroc. Since Tim Van Milligan will be there presenting, I'm sure that Apogee Components will also be there as a vendor. What I'm most looking forward to is the chance to get together with a bunch of fellow rocket obsessives and talk rockets all day. This is what I've been wanting for over two years! CG and I plan on talking to as many people as we can for the podcast (and I'll give some updates here as well). What I want to know is - what do you want to know? Ever have a question for James Barrowman? Always wanted to know something about some of your favorite old Centuri rockets? What about a question for the NAR president? I can't promise I'll ask every person every question. Just looking at the schedule, there's so much going on, I won't possibly get to all of it. I'm going to have to plan my day carefully. I'll probably cover the more n00b stuff - model rocketry, etc. - while CG will probably focus more on the HPR stuff. But who knows who I'll bump into and what fascinating conversations we might have? A chance encounter could become an entire show or blog post. But I would like to know what you would like to know, so that if I get the chance to ask, I can. If there's something you'd love to ask someone at NARCON, email me at iamtherocketn00b@gmail.com, or email the show at mailbag@therocketryshow.com. Admittedly, I've been sitting on this one for a while. Longer than I thought. In December, I made a bad decision up in Maine. It was a windy day, the final launch of the season for me, and not good flying weather. 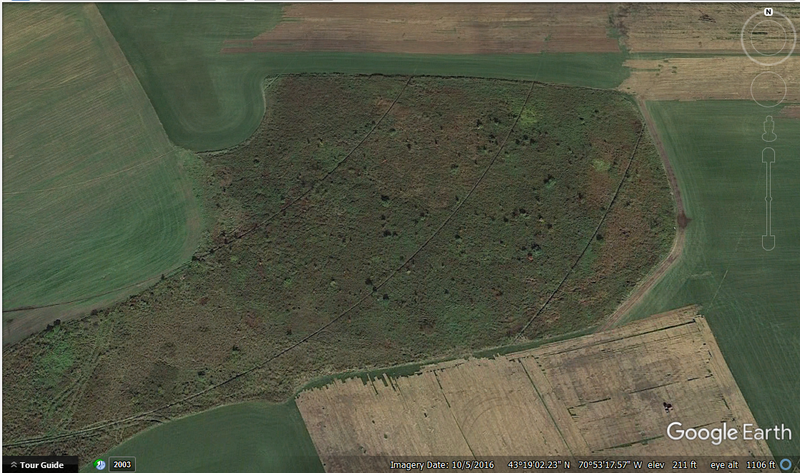 The field up there is enormous, and perfectly flat. Nevertheless, it was cold and the wind was about umpteen miles per hour. But we had rented a car, driven all the way up there, and I wouldn't get the chance to fly again until April. I had what the astronauts used to call Go Fever. I had made a couple flights already with iffy results. The first was with my Quest Quadrunner, a four-motor cluster rocket. The Quadrunner struggled off the pad and arced over without gaining much altitude. I thought it was due to the wind, which certainly was a factor, but when I got the rocket home, I discovered that one of the four motors failed to ignite. Though it is charred from blowback, the motor at the bottom did not fire. A seven-second delay was too long for this flight. The nose cone popped off and chute opened when the rocket was perhaps 8 feet in the air or less. There was some fin damage. My next flight was on the scratch built Ceres B booster, from the book Make: Rockets: Down-to-Earth Rocket Science by Mike Westerfield. It carries a camera payload and can fly on just about any 24mm diameter motor I choose - black powder or composite. I intended to make two flights with the Ceres B. The rocket had previously only flown with an Estes E9-6 black powder motor, to an altitude of 764 feet. I was planning to fly once on an E15 and once on an F12, both AeroTech composite motors, and take the rocket to a higher altitude. The E15 flight went just fine until landing. Then the wind grabbed the parachute and dragged the rocket a good 75-100 feet through the sand. I had to run to chase it down. flipped over in the sand, as the tracks shifted positions. Other than some cosmetic damage to the payload section (chipped balsa in the camera window), the rocket survived quite well, despite collecting some soil samples on the way. I was ready to give up flying for the day after those two launches. But here's the issue: While the E15 is a single-use motor - just pop it into the rocket and fly - the F12 is a reload. You have to assemble it. Left: AeroTech F12-5 reload kit - 3 motors per kit. Right: AeroTech Reloadable Motor Systems (RMS) casing. Now, before I start rambling all about composite motors and reloads, etc. (I just deleted three whole paragraphs, due to that rambling), I'll just say this: you don't want to leave an assembled AeroTech reload just sitting around all winter and then try to use it months later. It has rubber O-rings and greased parts in it, and after a while, those parts can get compressed, and fail to spring back. When that happens, you can get hot gasses leaking where you don't want one, and the motor is likely to CATO - basically, the motor blows through the casing and can destroy the rocket. On recovery, the Ceres B shock chord and chute got so tangled, and my hands were so cold, I couldn't possibly fly it again that day. It would require some major detangling at home. But I had this motor. It was the first time I'd ever built an AeroTech reload. I couldn't just store it over the winter and use it in spring. And I wanted to know if I'd built it right (AeroTech reloads are generally more complicated to build than Cesaroni reloads. Cesaroni and AeroTech are the two most popular brands of reloadable composite motors). The completed motor. The red cap on the lower left is the nozzle end. The red cap on the upper right is the ejection charge. This is why I flew Ceres B on the E motor first. I wanted at least one good flight from in case my F motor had a CATO due to incorrect assembly. So, I found myself in what seemed like a dilemma - on the one hand, I didn't want to fly any more, and risk losing or damaging one of my nice rockets. On the other, I had this unused AeroTech reload, and I needed to do something with it. In retrospect, I suppose I could have taken the motor home, disassembled it, soaked the propellant in water to destroy it, and thrown it in the trash (that's how to properly dispose of a motor you don't plan on using - for example, if it's damaged and probably not safe to fly), and cleaned the grease off the casing. Call that motor a loss. That's not what I did. Since this was my first time using an AT reload, it did not occur to me that this would have been a smarter thing to do. Instead, I decided to fly the motor. One of the rockets I'd brought with me was one I was pretty proud of - my clone of the Estes Astron Sprint XL. A very simple looking rocket, but I had gotten the paint about as perfect as can be expected. It was so shiny and smooth! You may well ask why I would then risk flying this rocket in high winds. My reasoning is that, while I really love the way this rocket came out, it was basically built from scratch. I have the parts to make it over again, and in fact, it was only made as "practice" for the kit, which you can see unfinished at the top of this post, and which I started building over a year ago. I reasoned I could always build this one again, pretty cheaply, if, say, it got damaged by dragging through the dirt like Ceres B.
I installed the F12 motor into the Astron Sprint. There was some wiggle room between the aft end of the rocket and the motor hook, so to prevent the motor sliding back and forth during flight and ejection, I taped it in place. Not pretty, but I figured it should work. Composite motors are more economical on a per-flight, total impulse basis. What I mean is that you get more power per flight per dollar than you would with black powder motors. A 3-pack of F12 reloads costs about $30, or about $10 per motor, which isn't bad at all, considering that these are F motors. The casing, however, cost about $40. I didn't want to lose the casing, so I packed the chute using the Jolly Logic Chute Release, and set it to release the parachute at about 200 feet, if I remember correctly. This should have kept the rocket on the field, where I'd be able to recover it. The Maine Missile Math and Science Club flies from a beautiful field in Berwick, Maine. 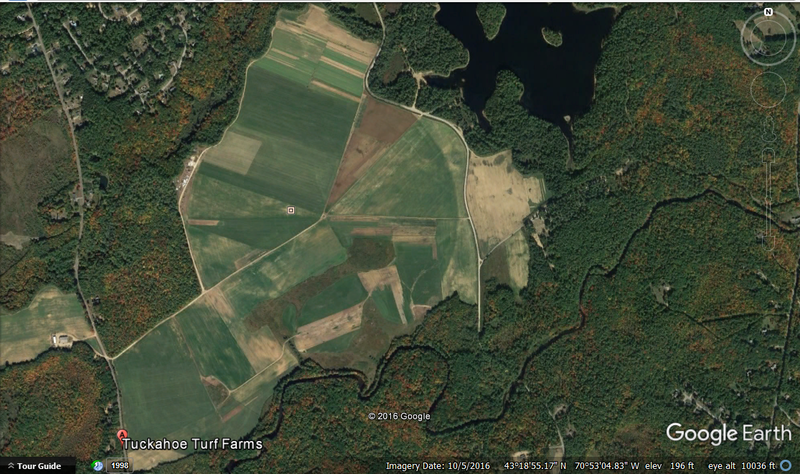 It's a giant turf farm, with acres and acres of perfectly flat ground covered in short, soft grass. It's nearly like walking an a giant putting green - the grass is that soft. Flights to 10,000 feet are permitted there, and the landowner is happy to have us there. It's perfect for rocketry. 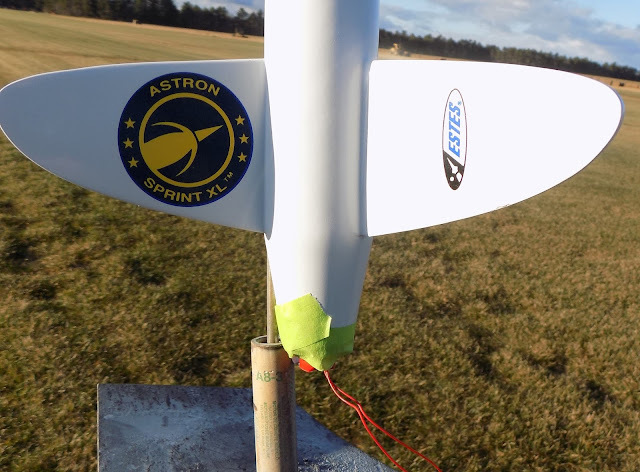 The Launch Control Officer counted down from five and pushed the ignition button - and the Astron Sprint XL took off like a shot! The F12 is a longer-burning, lower-thrust motor, but for a lightweight model rocket like the Aston Sprint XL, it's got plenty of kick. The rocket climbed a tower of thick black smoke, arced into the wind and nearly disappeared from sight. At apogee, the nose cone popped off, and the rocket began to tumble. Despite having the parachute tightly held shut by the Chute Release, the wind took the rocket quickly down the field. At around 200 feet, the Chute Release opened, but the parachute was stuck shut - which, considering the wind, was a blessing. However - and this is the heartbreaking part - despite the fact that the rocket stayed on the field, and the fact that I never lost sight of it completely, it landed in the one bad spot in the middle of all that beautiful turf. 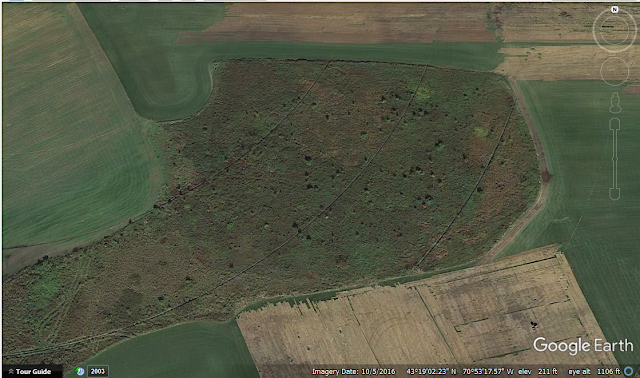 There is one long, narrow patch of swampy brush, and the Sprint landed somewhere in there. I carefully kept a bead on it with my eyes, but when I got to the edge of the swamp, my heart sank a little. It can be easy to walk off course when following a missing rocket, but I knew I was on the right path when I found the one clue - a bit of blue Quest recovery wadding, which I nearly always include in my fireproofing. It must have fallen out of my Sprint as it passed over the edge of the swamp. Hoping it had perhaps overshot the swamp, I ran around to the other side, but it was no use. I would have to trudge through shoulder-high reeds, thorns, scrub, etc, hoping to locate the downed rocket. I walked into this, and it got pretty rough in there. I nearly twisted an ankle a few times, got thorns in my leg, got my foot pinned in some underbrush... And the rocket could have been anywhere. I could have walked right past it several times. After about 45 minutes in there, I realized I may never find it. I'd have spent more time looking, but it was getting late and dark, and very cold and windy, and the launch was winding down. So, I lost the Aston Sprint XL clone. But worse - I lost the AeroTech casing and the Jolly Logic Chute Release - a loss of about $170 in one flight, not counting the rocket! All this brings me to what I've been working on recently. 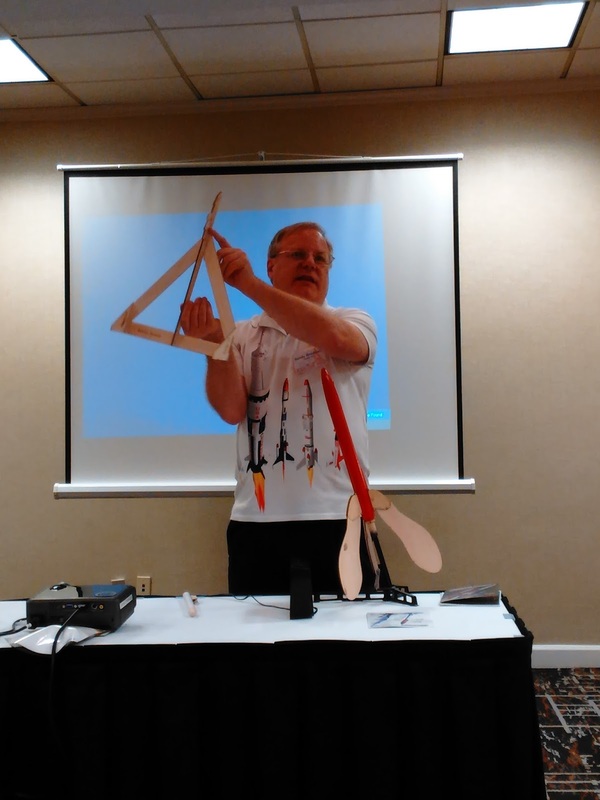 In September, Chris Michielssen wrote an inspirational blog post on the Model Rocket Building blog entitled Jake Parker - Finished Not Perfect. It spoke to me. 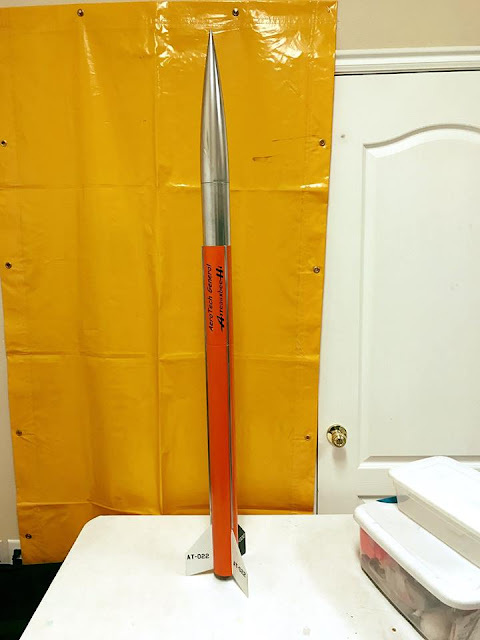 At the top of this post, you see the beginning stages of a build of the Estes Astron Sprint XL kit. I posted that on my Current Projects page - in December 2015! I only recently realized I had started this simple build that long ago! The clone - the one I lost in December - was essentially "practice." I like to streamline my fins and sand them into airfoil shapes. It's something I don't find to difficult on a standard fin with four straight edges. But with an elliptical fin, I wasn't sure how to do it or where to begin. So I traced the kit fins onto some balsa, cut out some copies, and started practicing. Here is a first attempt. The leading edge is simply rounded. The trailing edge is beveled, but the bevel doesn't go too far into the fin cord. Pretty basic, not perfect, but I was able to do it pretty quickly without too much difficulty. It seemed like sanding a better airfoil - and getting all the fins the same - should be feasible. So I tried doing a set of three, with a longer beveled trailing edge. The guide lines will help me keep my beveled edges even - so I hope. a bit of black marker will aid in keeping my sanding straight on the outer edges of the fins. I've sanded a little closer to the center on one side of the fin than on the other. The guide line shows me where I need to even things out. Checking the evenness of the beveled trailing edges. They'll get sanded down further to nearly a sharp edge. Once I had three fins which looked the same, I figured I had the technique down. And the fins looked so good, I decided I'd build a whole rocket around them. The current Estes BT-60 nose cone package you can buy includes the nose cone and tail cone from the Astron Sprint XL, so it would be simple to just make another one. The nose cone pictured at the top is the Aston Sprint XL cone. The tail cone is attached. I figured I'd end up with two of them, finishing around the same time. was added later, once I had sanded off a slight overhang and filled in the seams from the molding process. Once I got going, I spent a lot of time and care focusing on the clone. It paid off - the rocket looked beautiful. But the fact that I'd done so well on the clone made me hesitate on the kit - what if I messed up the fins? What if the paint job wasn't as nice? I'll work on it next week, I kept thinking. This is what I've found. As I've gotten better at building and finishing, better at making my rockets look nice, I sometimes hesitate. I'm not so experienced that I can consistently get great results. I usually get pretty good results, sometimes really good, and sometimes horrible - especially with paint and sanding. I finally decided I had enough half-built rockets lying around, and how hard could it be to airfoil those fins again, anyway? Besides, I could always make more. Not only did it roll, but on its first flight, it rolled and wobbled. Such an odd flight! It meant that the center of gravity was not in line with its vertical axis. I wish I had video of that flight, because it was so unusual. So, I did something when building the Sprint to make the rocket spin fast on every flight. It may have been unevenly sanded fins - one potential pitfall of trying to streamline them. I think a likely culprit was that I got both launch lugs on slightly crooked, causing uneven airflow and inducing roll. The point is that the rocket looked pretty, but it was far from perfect - it was still just practice. There's nothing wrong with trying to improve your skills and make better and better rockets, but you actually have to build them and accept that you will make mistakes. That's always been a little tough for me. The Astron Sprint XL needed to be finished, and I needed to start with those fins. So, I did it, and it wasn't that hard, and they turned out looking great. I did these ones a little different than the last ones. While on the clone fins, I beveled the trailing edge and merely rounded over the leading edge, on the kit fins I decided to do what I guess it's appropriate to call an elliptically rounded leading edge. That is, instead of simply rounding the edge, I beveled it to a narrower thickness first, then rounded that. This was in an attempt to give the fins a more "teardrop" cross section, appropriate for an airfoil. It's what I tend to do on my rockets with straight-edged fins, when I decide to airfoil them. Connecting the points where the guide marks cross. For most fins, I'd use a straightedge to mark a guide line. For these, I was able to use the leading and trailing edges of the fins to connect the points. Double-checking that the guide lines were the same distance from the leading edge. I had done the same thing for the trailing edges, which you can see here are already sanded. Once I got the trailing edges beveled, I gently rounded off any sharp corners left from sanding. You can see the fin changes from flat to beveled in a nice, even curve. I find guide lines important when airfoiling fins. Also important - checking my work against other fins. In this case, I was lucky. I had an extra set from a kit which was smashed in shipping. The fins survived. Once the leading edges were beveled to a narrower thickness, I rounded them over with a small piece of 220 grit sandpaper. Not exactly "teardrop-shaped," but close. A sharper trailing edge (left) and an elliptically-rounded leading edge (right). That's where I am at the moment with the Aston Sprint XL. Speaking of fins, I'm also playing around with trying to shape fins on a scale model, by building them up and sanding them down. Here's a sneak peek. This is just a first study. It's a work in progress, a rough draft of sorts. When I finish this little experiment, I'll talk about it on the blog. Editing on the video series on building the Quest Superbird has gotten bogged down, so I've put that build on hold until I can sort out the video I have. But I've completed five videos so far. Click here to check them out if you haven't seen them. That's an Estes Crossfire ISX with a drag-reducing tail cone. I'm doing it more to have something that looks cool rather than to reduce drag, but that's the idea. The tail cone is made from a leftover nose cone from an Apogee Components' Avion kit, from last summer's Rocket Camp. One advantage of building rockets with kids is that there are inevitably some left over parts. Because this is a modification from the Crossfire's original design, it will require me to double check the stability before flight. I'll surely have something about this on the blog in the future. Apart from that, I'm saving up to replace my AeroTech casing and Jolly Logic Chute Release. I hope to have more successes than failures to write about this year.